Jourama Falls is like no other. It's a pristine environment that terraces down into the valley and is a prime place to canyon. It's a very beautiful place at the top falls with views overlooking the the coastline and ocean to horizon. 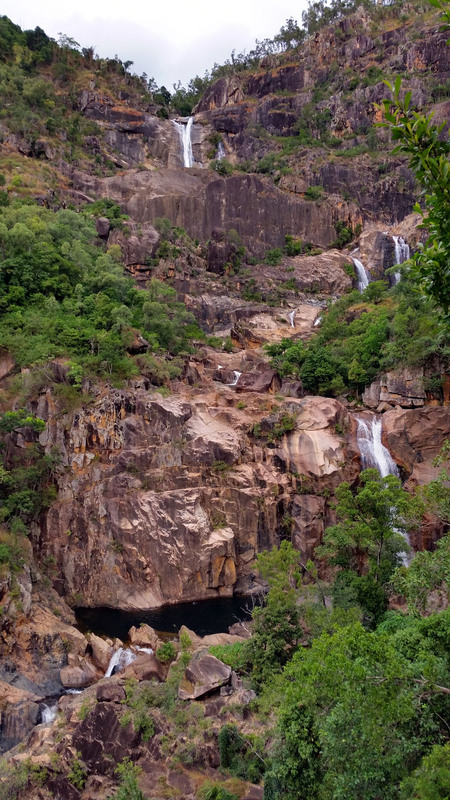 The easiest way to get to the upper falls is to hike from Jourama Falls National Park's lookout up. 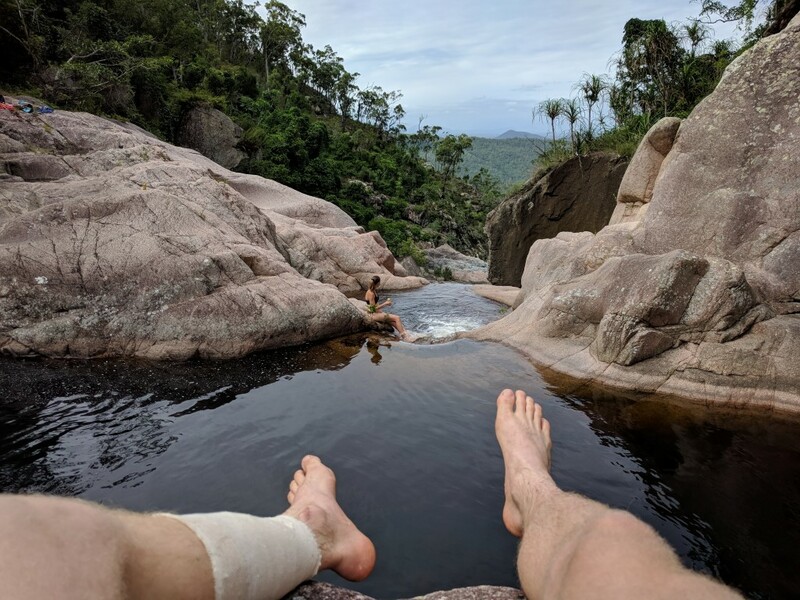 You can arrange a shuttle or have a friend drop you at Hidden Valley and walk down the Jacobsen's Track to the top of the blackhole swimming pool but you'll have to arrange access with the private land owner and have a short walk through dense rainforest to get into the creek. Paluma Dam to the top of Jourama Falls and then rappel the rest of the way. 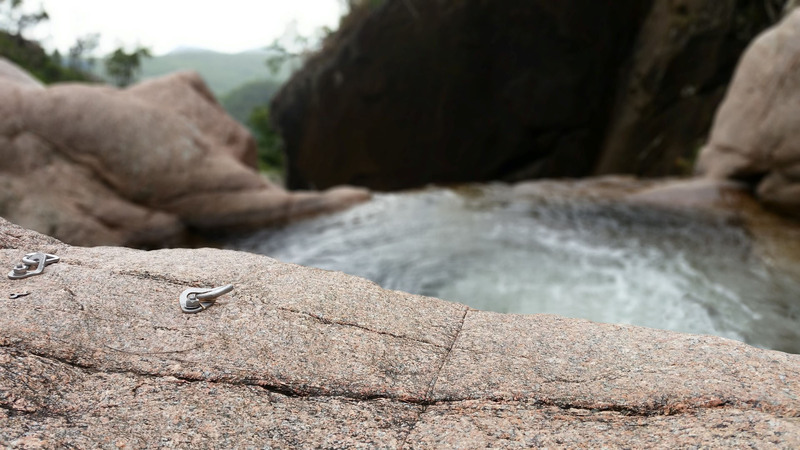 Hike from Paluma Dam to the top of Jourama Falls. This is a longer hike, but you are rewarded with an amazing view once you emerge from the rainforest onto of Jourama Falls. via Station Creek down into Waterview Creek and via the blackhole. There are two rappels down into the blackhole. 150m rope for the large falls (if halving the rope) or 70m if using a Fiddle Stick, Smooth Operator, or another rope retrieval technique / device. All the falls have been bolted or there's sufficient natural anchors to use (like a well rooted tree). Two bolts adjacent top of first major waterfall. 15m rappel. Single 40m Rope. Sloping pitch with overhang (watch your head) and pinning risk under waterfall at bottom in full flow. There are foot positions of the left-hand side of the waterfall as you are rappelling down. Rock hop to next rappel. Rappel all the way to the water or jump from small ledge two meter into water. Long swim to top of big falls; there's a shallow rock in water on way. 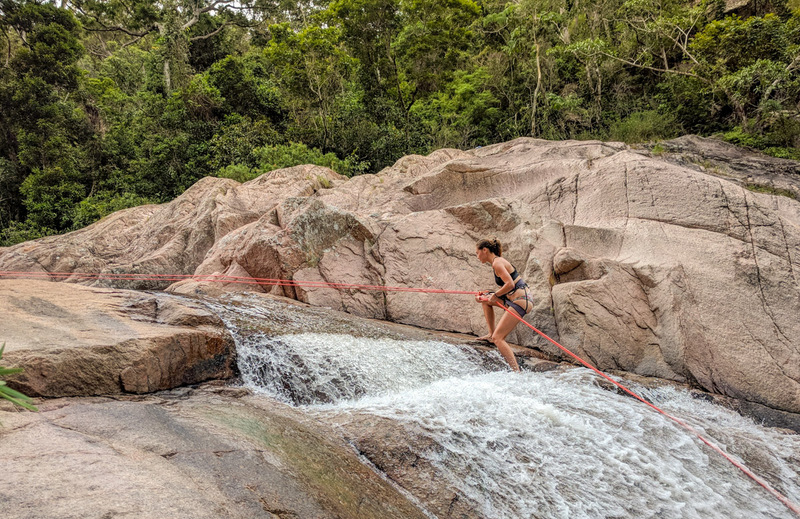 It's safe to slide down pool exit chute at low water levels, otherwise difficult to access next pitch without getting swept over 60m waterfall. Possible to belay down exit shute although not needed in mid to low flow. Long slab, heavy water, very slick. Two Bolts River Right of exit shute. 60m rappel. Double 60m ropes minimum. There's no anchors to get down next 20m waterfall. Exit pool River Right, careful slabbing traverse to major gully behind monolith down to long pool. Exit long pool at outlet (River Left), rockhop to above short falls. Option 1: Jump into pool. Option 2: Scramble around River Right down the gully and step into pool. Option 2: Climb around River Left arete of monolith to large tree for semi-dry abseil. Next anchors River Left on small ledge above stepped falls. Rough abseil down blocky, broken waterfall, heavy water. Anchors may bind ropes so you may need to be extended with a sling and mallions to a single point. Hard to retrieve rope if using rope retrieval techniques. This route not attempted, but may be a cleaner route with less risk of ropes not pulling. Sacrificial sling required. It is also possible to descend the far River Right shute of the waterfall with caution. There's an old rope left behind by previous adventures tied to bottlebrush. Use an aged bottlebrush as an anchor to descend 10m abseil, then slabby exit down to pool behind monolith. Otherwise, it's possible to skip this abseil and continue on down via rock scrambling. River Left rappel from tree down beside waterfall into water. Please not that an activity permit may be required.